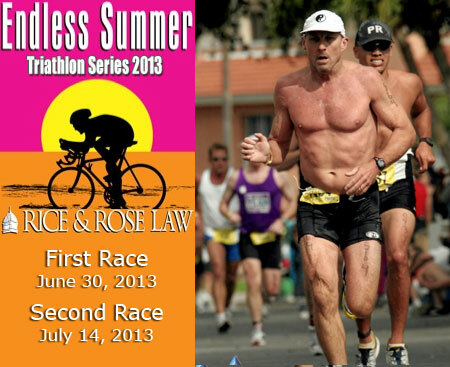 The Rice & Rose Law Firm will again be the title sponsor for 2013 Endless Summer Triathlon Series. This will be the sixth year in a row that Rice & Rose has been the title sponsor for this sprint race series which is staged at the Frank Rendon Park on the beach in Daytona Beach Shores. The first race on June 30th is a 400 yard swim, 8 mile bike and 3 mile run, and the second race on July 14th is a 600 yard swim, 12 mile bike and 3 mile run. The swim is in the Atlantic Ocean and the run is on the beach. The bike course is on the newly paved State Road A1A. For more information about this sprint series and other triathlons in the greater Daytona Beach area, go to www.tigersharkevents.com.